Welcome to Idaho. Not quite “big sky country,” but close. Montana’s about an hour north of here. Wyoming’s due east about 45 minutes. 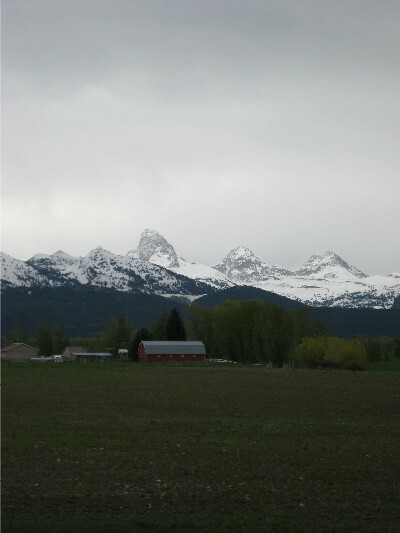 On this chilly grey morning, all three of the highest peaks in the Teton range are visible from our back porch for the first time in three days. The defiant Grand Teton juts a crooked finger into the tossed cotton sky. What the hell am I doing here, two thousand miles from the crippling humidity of my home pond? Why, I’m vacationing. Me, my girl, her parents, her sister and her sister’s husband are all resting quite nicely in a jumbo log cabin in the middle of a huge prairie, surrounded by mountains on all sides. It’s flipping gorgeous. On an all day excursion to Yellowstone yesterday I kept expecting to see Napoleon Dynamite running down a side road in a powder brown tux. ‘Round these parts “cowboy” is a verb. As in “cowboy up,” which I guess means put on a big hat and beat a horse. Maybe drag a homosexual behind your pickup. I don’t know. I’m leery of overly American idioms. Too much time spent amongst the lily-white folks of Lake of the Ozarks, Mo. But they’re friendly enough. On Saturday night we rolled over to Dave’s Pub in Tetonia proper on the recommendation of our cabin’s owner. “Local flavor” was promised and boy, was it delivered. As Delilah and I walk in, no fewer than ten jet-black Stetsons snap around to our position. It’s such a movie cliche that it’s a little shocking to experience it in real life. Slowly, the music comes back on and conversation resumes. We don’t stick out too much, but we’re dressed a little like ski tourists and I guess they don’t get too many of those this far from Jackson Hole. It’s Karaoke night, and the local color is letting loose on the mic and on the dance floor. The bartender isn’t sure whether they have Heineken (!? ), but they’ve got a Jagermeister-meister, so we do shots and drink Coronas. I tip generously in the hope of having at least one person on our side should madness break out. Manning the karaoke machine is Angel, a sweet middle-aged country girl in a bright red oversized t-shirt with long Indian feathers silk-screened down the front. She spots us immediately and announces our presence to the room – as if anyone hadn’t noticed. “We’ve got some newcomers here tonight!” More attention we’re trying to avoid. I’ve been in these situations before. Everyone here is local. The men in the room aren’t just looking at us, they’re sizing me up. Am I a “friendly?” (mostly) Did I vote for John Kerry? (probably) They want to know if we’ve wandered in for trouble or just a few beers. Angel comes over and introduces herself after announcing that no covers of “Chixie Dicks” songs will be allowed. She finds out we’re from Virginia, and, taking to the mic to tell the assembled, we’re greeted by a rousing chorus of “Cowboy Up!” from the more drunken amongst the rabble. There’s a one-eyed cowboy at the bar looking ornery, but as we turn to take in the scene, he’s out on the dance floor two-stepping with some local filly to the still-incredibly-popular stains of “Footloose.” It’s all pretty surreal, but kinda wholesome despite the ominous vibe. I’d have taken a picture, but I didn’t want to risk angering the bears. Delilah attracts a tall cowboy with a white handlebar mustache, matching Stetson, and an Arizona State sweatshirt. Fred is from southwest Virginia, and he tells us we’ve done the right thing, coming the extra mile – past Colorado, past Wyoming – out here to where the air is fresher, the water is cleaner, and the cowboys still wear giant hats. He’s got a point. You get the feeling when you’re here that there’s still something good in this country left to explore, some wild thing you’ve never seen just around the next bend, some wilderness that will never be spoiled by billionaire assholes with over-priced condos on the brain. It’s gorgeous and almost hidden, like the Grand Teton, once again obscured by the weather pattern foaming from its peak: a thick lily-white cotton veil that it lifts over its own head, daring you to ignore it. We’re getting along just fine at Dave’s, regularly avoiding Angel’s requests that we get up and do some karaoke. I suspect we’d have made friends for life if one of us could have delivered a half-decent “Stand By Your Man,” but we were both worn out from a long day of plane flights, and took our leave quietly without saying goodbye. It’s going to be a long week in the Rockies, and we both need some rest. This entry was posted on June 10, 2008 at 3:07 pm and is filed under cripsyduck with tags cowboys, idaho. You can follow any responses to this entry through the RSS 2.0 feed. You can leave a response, or trackback from your own site. Nice talk. Reading this almost makes me feel like I was there. So you’re saying there was actually an ornery looking, one-eyed cowboy at the bar? I thought that was only in the movies! It takes some of the charm out to know that he got up and danced to Footloose, though. I mean, how ornery could he be? now that you’ve broken the ice, go for the home fun and request “freedom isn’t free” from Team America World Police as your karaoke tune. Yes! Freedom costs $4 a gallon.